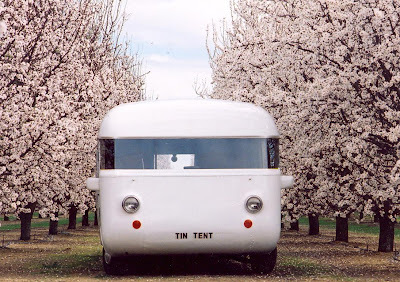 Ultra Van #366 (Tin Tent) has seen a lot of changes in its time. 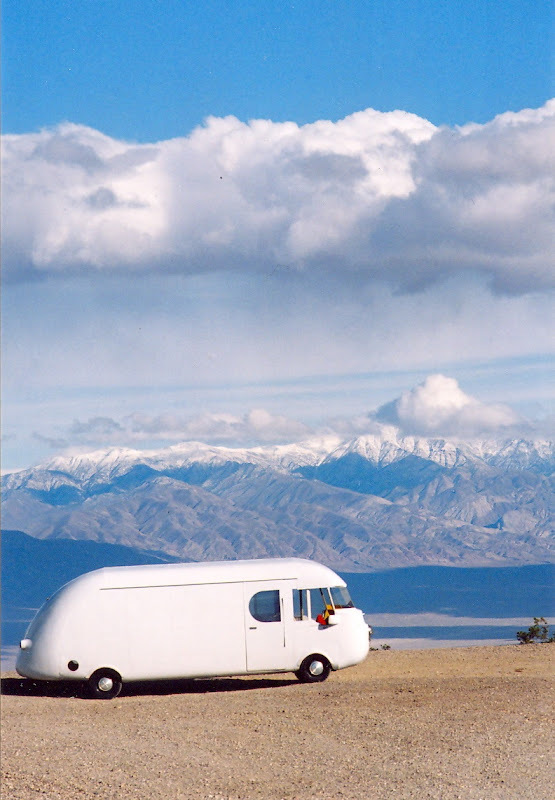 After all, you don't get a motorhome that will beat 20 seconds in the quarter mile by accident. But most obvious - and perhaps most radical - is the flat glass windshield. 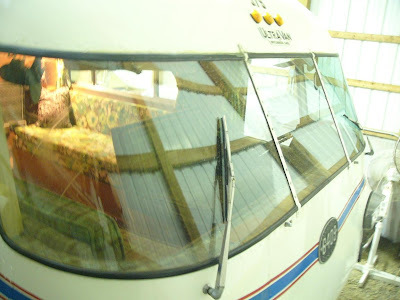 In 2004, when many UltraVanners were wondering if replacement windshield scarcity be would be the Achilles' heel that finally forced their beloved coaches off the road, 30-year UltraVeteran Walt Davison decided to see if it would be possible to fabricate a custom windshield out of cheap and readily available flat-plate laminated safety glass. Walt wanted the largest span of flat glass that would fit into his Ultra without irreversibly altering the structure. He also felt that the main section should be rectangular to permit easy repair while traveling away from home. He found that he could fit a 76.5" x 22" sheet of glass in place if it were set back from the original center section by 5 inches at the bottom and 2 inches at the top. This left the glass nearly flush with the body at the outboard corners. Careful layout was required to generate two irregular smaller glass pieces to fill in at each side. 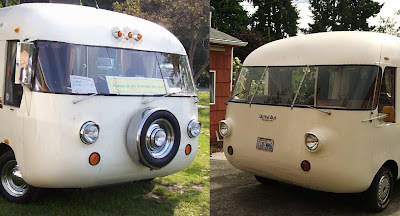 The original Ultra Van windshield installation used a simple H-section rubber seal that slipped over the glass on one side and the body sheet metal on the other. This technique was typical for the time, and it works adequately as long as the windshield curvature matches the body contour. It does tend to develop leaks easily though, and requires frequent seal maintenance. Current practice, however, is to take advantage of modern sealant technology and bond the glass in place. 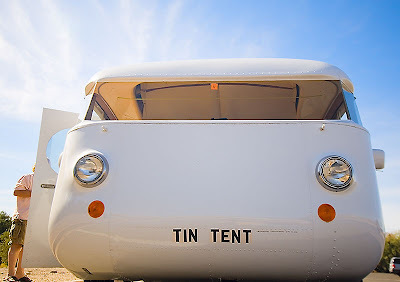 For this you need structure to overlap the glass, so Walt and his assistant constructed support angles out of 0.040" aluminum sheet and sealed & riveted them to the existing Ultra Van structure. Because of the large inset of the lower main glass, they also installed additional supports underneath. The glass panels were set into place with small rubber pads behind them, and quarter-inch wood shims underneath them, to create spaces which were then filled with transparent silicone RTV. The seams between the window facets were also filled with the clear sealant. After this cured, the wood shims were removed and the resulting gaps were filled with more of the RTV. Once the glass was securely installed, the aerodynamically shaped fairings had to be created out of urethane foam, e-glass cloth, and polyester resin. After shaping, glassing, filling, sanding, more filling, and copious additional sanding, the fairings were painted to match the coach and bonded into place using clear RTV and white 3M 4200 sealer. The final touches included modifying the windshield wiper arm to fit the new configuration, and installing interior panels to give a finished appearance. Walt is a professional pilot (retired), and has always been fanatical about weight reduction, so his interior treatment is somewhat unique. Because they can be so hard to find, many Ultra Van owners buy extra OEM windshields whenever they find them available, and store them against future need. These can cost anywhere from $1000 on up to whatever the market will bear, and in the event of an accident away from home, the panels have to be shipped to the coach location - delaying an already painful repair job. Though Walts flat glass project took well over 60 hours of skilled labor to complete, the glass itself only cost $100 for the large section and $25 each for the four smaller pieces - making them quick, cheap, and easy to replace literally anwhere in the country. Walt was quite pleased with the finished product, though he acknowledges it would not be right for everyone. As long as the OEM glass continues to be available, it is undoubtedly an easier solution. Walt retired from Ultra Van ownership in 2007, but he is still an active member of the Ultra community, and is more than happy to answer questions and give advice backed by his 32 years operating four different Ultras (#371, #452, #286, and #366). He can be reached easily through the Ultra Van message board at Yahoo! Groups. "New Flat Windshield From Walt 'lite' Davison"
"A Solution to a broken windshield, the Flat windshield"
Fifty years after the first Ultra Van was created, it seems like there are almost as many different variations in windshield installations as there are Ultra Vans. But it turns out that there was remarkably little variation in the original installations - especially considering the almost bewildering number of different Ultra Van configurations. 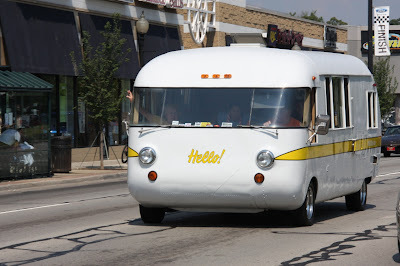 All Ultra Van, Ultra Coach, "Go-Home", and Travalon coaches - excepting only the #700 prototype - use the large two-piece laminated safety glass windshield that Union City Body Co. developed for their 1951 round-front delivery van, known best as the 1958-1967 Chevrolet Dubl-Duti Step-Van. Due to the extra width of the Ultra Van, a third section of flat glass was required to make the curved windshield pieces work. 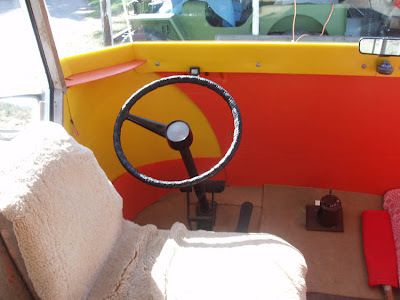 The stock step van pieces have generously rounded corners and a slight "bow" to the inboard ends of the glass; so in order to make a smoother transition to the flat center section, roughly seven inches were originally cut off of each step van piece and the flat section extended to fill. 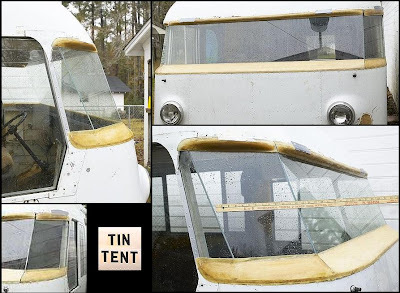 Windshields are secured to the Ultra Van body using rubber edge channels, and up through 1970 the seams between the glass sections were filled with rubber gaskets. These were covered by aluminum strips bolted thru the gaskets. A slightly different technique was used for the five 600 series coaches built from 1971-1973. They used the same rubber edge channels, but the seams were simply filled with transparent sealant. This gives the coach a much cleaner look, but it requires more care and skill to achieve a weathertight seal. Either technique can be applied to any Ultra Van however. In the years since production ceased, step van windshields have become harder to find, more expensive, and more difficult to cut. As a result, many Ultravanners have found ways to use the original stock windshields without cutting them. For those who have access to a skilled glass worker, a remarkably clean installation can be achieved this way. Or, for a more vintage look, a little bit of extra sheet metal work can make the fitting of the center flat section much easier. In order to save an expensive new windshield section that had developed a disfiguring crack across nearly half its length, one restorer cut off almost all of the flat section of the stock pieces and filled the center with a vast 46" wide section of flat glass. This installation appears to put the seam rather close to the driver's view forward, but with careful fitting and filling the distortion is minimized. Inspired by this last installation, and fed up with the scarcity and expense of step van glass, another audacious experimenter decided to get rid of the curved glass entirely and install a panoramic 76.5" wide plate glass center section. The result looks a bit unorthodox, and the installation took a great deal of hand fitting to provide the support for the glass. But in the event that a repair is needed, the replacement glass will cost approximately 1/10 what a step van windshield would cost and is readily available at any auto glass shop around the country. And the view is unparalleled!